German lexicographer; lived at Berlin in the sixth decade of the eighteenth century. 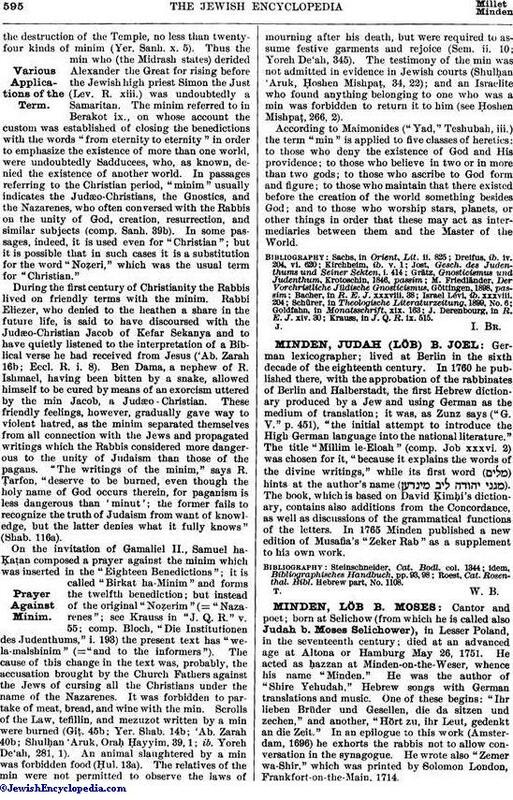 In 1760 he published there, with the approbation of the rabbinates of Berlin and Halberstadt, the first Hebrew dictionary produced by a Jew and using German as the medium of translation; it was, as Zunz says ("G. V." p. 451), "the initial attempt to introduce the High German language into the national literature." The title "Millim le-Eloah" (comp. Job xxxvi. 2) was chosen for it, "because it explains the words of the divine writings," while its first word ( ) hints at the author's name ( ). The book, which is based on David Ḳimḥi's dictionary, contains also additions from the Concordance, as well as discussions of the grammatical functions of the letters. In 1765 Minden published a new edition of Musafia's "Zeker Rab" as a supplement to his own work. Roest, Cat. Rosenthal. Bibl. Hebrew part, No. 1108.